New Xbox One S All-Digital Edition drops 4K Blu-ray support | What Hi-Fi? Microsoft has officially unveiled the first disc-less Xbox, as rumoured. 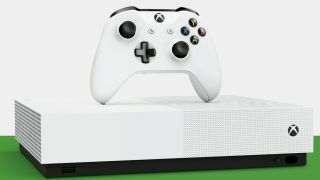 The Xbox One S All-Digital Edition can only play games that are downloaded or streamed from the internet, as there is no disc slot. That means it loses 4K Blu-ray support, so it may not be high on the list of those with big Blu-ray collections. However, it can still play films in 4K Ultra HD if they are streamed or downloaded. The new Xbox also supports HDR and Dolby Atmos, so you should still be in for quite a viewing experience. The console, which goes on sale next month, ships with a 1TB hard drive along with cloud storage for games, films, back-ups, saves and the like. It also comes with Minecraft, Forza 3 and Sea Of Thieves pre-installed. It will ship on 7th May and cost $249. Pre-orders are already live in the US. UK pricing is yet to be announced, but as the current Xbox One S, complete with disc slot, is available for under £200, we'd expect it to be around that mark. Microsoft isn't the only one working on a new console. The Sony PlayStation 5 may feature Dolby Atmos and 8K graphics, according to a Sony exec, though the PS5 won't launch until next year.